On Sunday, March 13th, students and teachers experienced the mystery of an ancient Chinese water town in northern Zhejiang province – Xitang! Students and teachers took a break from their Mandarin Chinese language courses and enjoyed a full day of adventure and fun – marveling at the beautiful scenery and learning about the town’s thousand years of history. 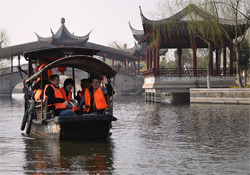 Sunshine and smiles marked the action-packed day that started off with a boat ride through the historic town’s canals with fantastic views of antique residences and temples. Pictures from the fun trip can be found here – click here. More information about the town of Xitang can be found here – click here.